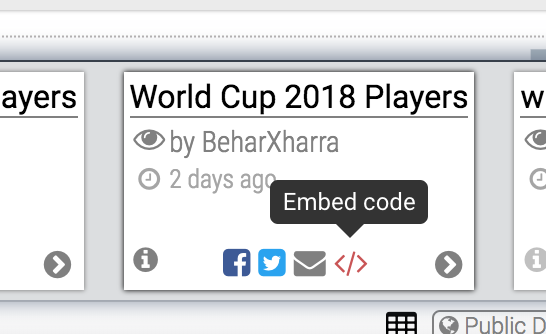 You can embed Keshif dashboards in other websites using our embed codes or an embed service provider. Copy and paste the html code to the page you want the embed. Simply insert a Keshif dashboard URL into the external site (such as a blog post in Medium page). An embedded dashboard frame will be created automatically! This feature uses the oEmbed standard. If a platform supports this standard (such as embed.ly or data.world), you don't need to copy and paste the html embed code. The dashboard URL will directly converts to an embedded interactive content, without any other step. The dataset needs to be public. The dashboard needs to be public. The dashboard owner needs to be on Magellan plan. Dashboards created with Piri-Reis plan cannot be embedded. Embedded dashboards are viewed as public. So, even if you are logged into our platform, you'll view an embedded dashboard as a public/anonymous visitor. Embedded dashboards support exploration within the dashboard, but do not support authoring capabilities (such as adding or removing charts).